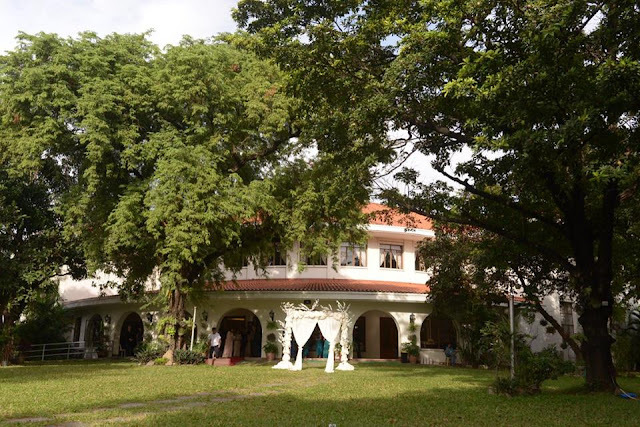 You can read here and here some back stories of how I got to choose Light of Love as our wedding party venue, you can check there photos too. It is the very first supplier we've booked, and one of the suppliers I am most grateful to. Thanks to Stephanie, our AE, for making this aspect of our wedding planning a breeze! The moment I inquired thru email up until after the wedding, I have never encountered any problem whatsoever in dealing with Steph. She was so accommodating, friendly, helpful and smart. She was always so willing to answer any of my queries even if it's late at night or during her days off. She's willing to help out and find solutions to my dilemmas. She's heaven-sent! Not only because of her, but over-all we never had any problems with the venue during the wedding. Everything turned out great. I highly recommend this events place! This is not really a supplier because it's a church, and it's obviously non-profit, but I'll include a review anyway for bride-to-be's who are considering this for their church on the big day. There's also a back story on how we booked this church, read here. After we have booked Light of Love, the next challenge is to look for a church nearby. Our criteria: (1) It has to be air-conditioned (it's non-negotiable because we do not want our guests, and ourselves as well, drenched in sweat during the ceremony, it could spoil the moment); (2) We do not like it big, we prefer an intimate chapel for the ceremony; (3) If possible, it's located in a quiet and private area. We are so blessed to have found Archbishop's Palace - it has all these, and it is not expensive. The first person we've talked to, whom we have booked our date, was Bro. Mart. But he soon left and went back to the seminary, he was replaced with Sister Elvy. We did not have any problems coordinating with them pre-wedding. Sister Elvy was so helpful with all my queries as our wedding day approaches. On the day of our wedding, the only problem we have encountered was the person in-charge did not want to lay the red carpet on the garden where I am supposed to starting walking towards the chapel's entrance. Since the aisle of the chapel is short, we extended the carpet up to the garden outside the chapel to make the bridal walk longer. 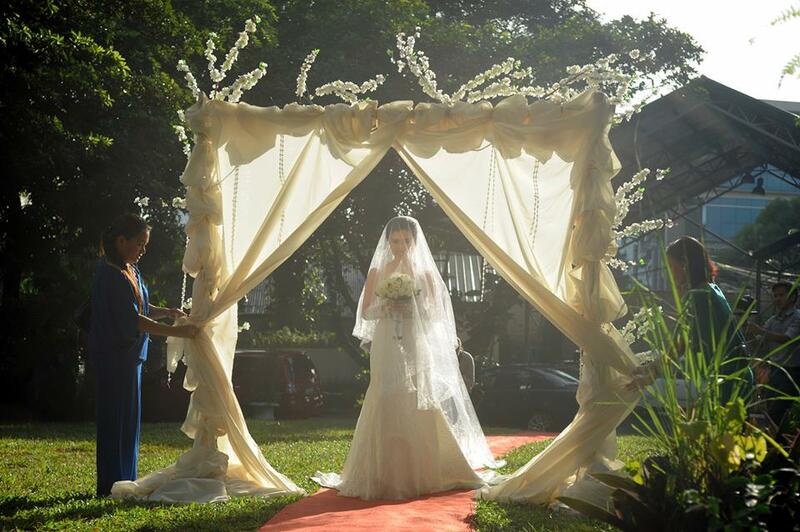 It was all planned, we even rented an arch with reveal curtain from our florist where I will "enter." The person in-charge's reason for not wanting to lay the carpet was it rained and the ground was wet. Well in fact, it has long stopped raining and the sun was shining so bright at the time. Our coordinators did the best they could but that person would not give in. If my super mom had not intervened, I would not have that walk that I will cherish for the rest of my life. Thank God mom is always there to rescue me! End of story, the carpet was laid, but it delayed the ceremony for a few minutes. Other than that, the ceremony went smoothly. The sound system was fine, the air-conditioning great, and we had a really intimate and solemn wedding ceremony. The caterer is one of the most important suppliers of a wedding. They provide the most essential aspect of the party, food. They also define the look and ambiance of your venue, if they are the only one who will be dressing it up - which is in our case. We have booked Hizon's Catering during a grand food tasting where I got a free hotel accommodation which we have used the day after our wedding - we chose Manila Hotel. You can read about our first food tasting with Hizon's here. I chose Hizon's for reasons of: having a good reputation (among all suppliers having the same price range in LOL packages), lots of freebies and upgrades, I liked the food at the tasting, they offer a variety of themes to choose from which you can mix and match. Let's talk about the crucial and "could sometimes be stressful" stage: Planning. 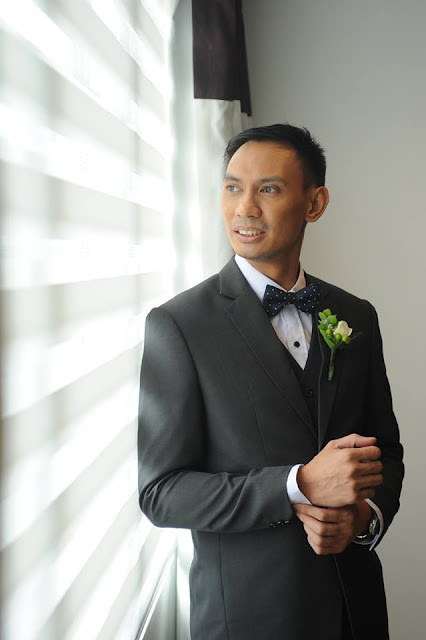 Since I knew that Hizon's would be, if not the most important, one of the most important suppliers in our wedding, I had to make sure that each aspect is clear and noted by our planner. My AE was Jorina (it's because I inquired to her first), and the event planner assigned to me was Justin. There were times Jorina would not respond to my text messages, same with Justin, and that stressed me out. If you are a bride-to-be and your catering point persons would not answer your queries about your wedding reception, it kind of turns you off and freaks you out at the same time. But at the end of the day, everything was sorted out well for the party. Our detailing went well. It happened about 4 months before our wedding. I came with my husband (fiance then), cousin, and friend - both were part of my entourage. Justin was accommodating, but seemed in a hurry towards the latter part of our meeting. I would love to discuss about this detailing experience soon - it is when you choose and finalize ALL the details including the menu, table cloths, center pieces, cake, backdrop, etc, etc etc. During the party, I was not anymore aware of how Hizon's handled things, but it seems like it went pretty well. Except for: my mom had to go into the kitchen to remind the waiters to serve the additional appetizers that we bought and turned over to them. Post-event these were my complaints: There were no left-over food turned over to us (I am sure there were some left as my relatives would say that). My biggest disappointment was: They did not return the ground coffee and the sugar and creamer packets, when in fact I think only my husband asked for coffee during dinner, no one else. I suppose they also took the mason jars that many of our guests left behind. (Many guests got drunk, and left the mason jar souvenirs which they have used during the party). It is a very common rule to return those, but no one bothered to do so. Not even the head waiter. I wonder how they divided these among themselves. It's not that much, but it's just so disappointing that their staff keep these things without permission from clients. There were also lots of tortilla chips (we brought these for additional appetizer) that were left unopened, if my mom had not seen those maybe they could have also brought it home. I have even written a letter to Hizon's general email address regarding this incident, but no response. Oh well. This is another crucial supplier to anyone's wedding day. I have inquired to tons, and met a few, and finally ended up with ES. The OTD coordinator was also one of the very first suppliers that I have booked. Karmie and Kaice were easy to talk to, a colleague got them for her wedding and she can vouch that they did a good job. Those were two reasons why I decided to get them to do our on-the-day wedding coordination. The many freebies they offer is a plus. And yes they did a fantastic job! I have booked them more than a year before our wedding, and I got to ask questions and get some advice throughout the planning, even though we have only booked an OTD coordination service. 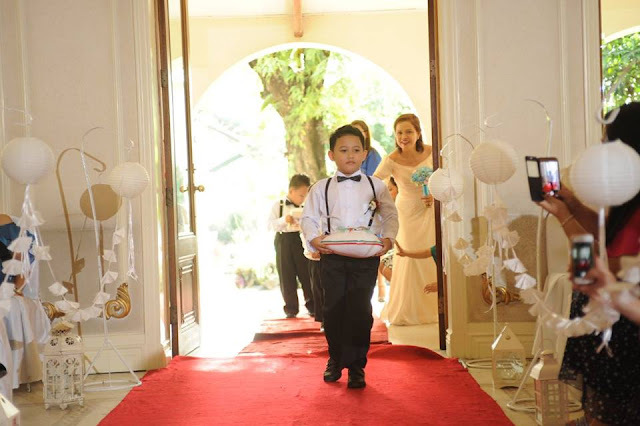 Kaice was the one in-charge during my wedding, though we've first met with Karmie during the inquiry stage. Kaice made sure I was well taken cared of the moment they've arrived the hotel up to the party venue. She made sure I was fed, I was comfortable, and the schedule was being followed. From the first meet up, up to the wedding day itself, we never had any problems with ES. We did the meet-ups during weekends (we've had 3), usually in a coffee shop, and we would have a step by step agenda for discussion on each meeting. I only took off one star from the rating just because they failed to persuade the person-in-charge at the church to lay the red carpet outside (if my mom did not intervene, my dream of walking down the garden on my march would have not become reality), and they have also failed to retrieve the left over food and almost untouched coffee sugar creamer from the caterer. But other than these things, I am very grateful for them! They did a very good job in making our wedding organized. Many guests also commended how organized our wedding was. So that's proof that they are really effective. Thanks to the ES team! We also got Karmie to do the party hosting which you can read about on the following item. It was much easier that Karmie hosted our party since she already knew the program and the nitty-gritty of our wedding. Plus it's also easy for her to coordinate with the whole production / other suppliers since she is also part of the wedding coordinators team. Karmie did a great hosting job. She was very articulate, lively, spontaneous, and it really showed that she's very confident at what she was doing. Her hosting style was classy, firm and fun, yet not intimidating. During our meetings, I have specifically requested for some things not to be mentioned, to be mentioned, how to be mentioned, etc. You just really have to be specific if you want something and work together with your suppliers, it's also a client's responsibility. With so many photographers in the wedding industry now, it can be quite confusing to choose who will capture the priceless moments on your big day. This day will happen only once, and we want to make sure the moments are captured beautifully - BUT without spending a fortune! We all know how well-known and reputable photographers can be so expensive nowadays - well it's talent, skill and experience that you are paying for, so no complaints. It is really up to you to choose which style suits you, and which rate suits your budget. You can find here the list of the photographers that we have considered. Again, this is another supplier that we have been blessed to find. We have booked Liz Ranola for our pre-nup shoot and the wedding day. 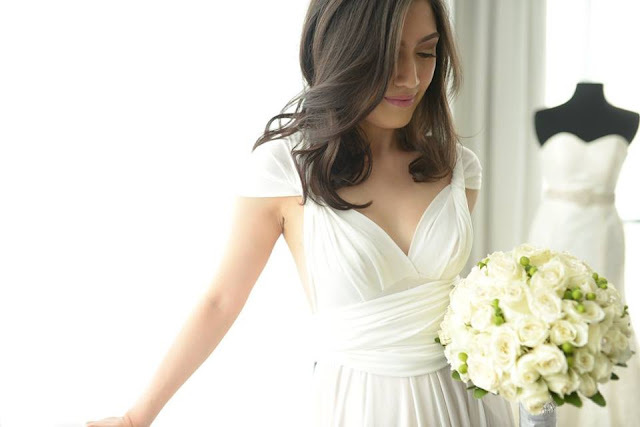 We first met with her in a coffee shop to discuss what we like to happen at the pre-nup shoot, and well just to meet. She was so friendly, warm and bubbly. 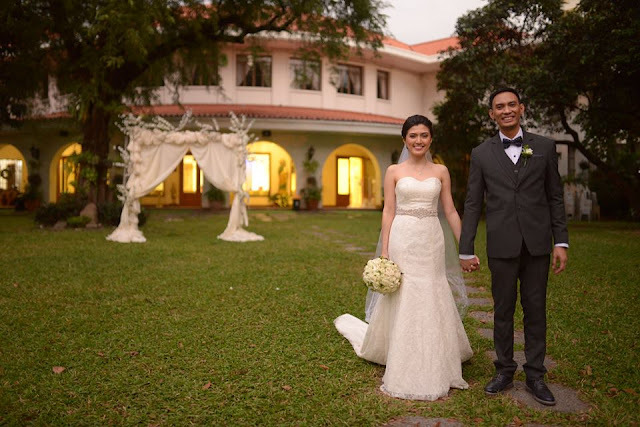 Here's our pre-nup shoot story. We had fun doing this shoot, and the photos turned out great. 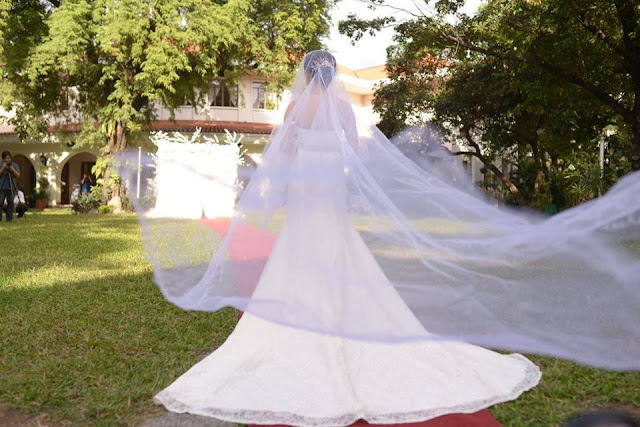 Her back-up photographer during this shoot was Macy Matienzo. Come wedding day, we saw each other again after many months, and it's like meeting an old friend. Sherwin Tolentino was Liz's second photographer during our wedding day. When the wedding photos on-site AVP was shown at the party, we were in complete awe. I didn't expect the photos to look that beautiful. It was great! I highly recommend Liz, and INP in general for anyone's wedding! All photos in this post except for the photo booth one are by Liz and Sher. I went crazy looking at and comparing SDEs and packages of several wedding videographers. It was insane. It was so difficult. It was like doing a thesis! We chose Vidlens for the ff reasons: I love all of their SDEs - it has taste, character, the editing is so good, very creative, overall output quality is good, in spite of their very affordable rates at that time. Well, up to now they are still quite affordable because they include free aerial shots in all of their packages, so I suggest you go check them out if you are still undecided. You can also read here my post about the photo and video suppliers options I had and my short list. Bryan was so responsive to all of my queries either through email or SMS. This is one quality of a supplier that makes me stick around. Even though my "inquiring period" was too long before I've actually booked them, he still replied to me always. He was open to my special request of having an unedited full coverage even if it is not part of the package. I wanted to have this full video of our wedding (even without musical scoring or any major editing), apart from the short and sweet same-day edit, so I can watch what really happened on our wedding day in full. I met with Bryan in the building where I work to finally book them, he's obviously passionate at what he does and listens well to suggestions and preferences. I had a good feeling that he is the right videographer for us. And boy was I not wrong! We were so happy with our SDE. We were in awe the entire time we were watching it for the first time in our wedding party. Our guests loved the video too. It's something we can watch over and over again, with our future kids and grand kids. You can watch it here. Screenshot of us watching the SDE for the first time in our wedding party. We first saw Infinite Soul performing in a wedding at LOL when we went there for our very first ocular - this was even before I have read about them on GirlTalk. We immediately fell in love with how their music, especially the sax part, added so much class and swag at the same time to the party. Boy they were good! At first I thought of their rate as kind of steep for my budget for the band, but eventually gave in when we found them in a wedding expo and got the ceremony performance for free - since this was my problem as our church do not provide a choir, soloist, or even a pianist. I know that getting a performer or group for church would cost more than what I would save in getting cheaper bands. 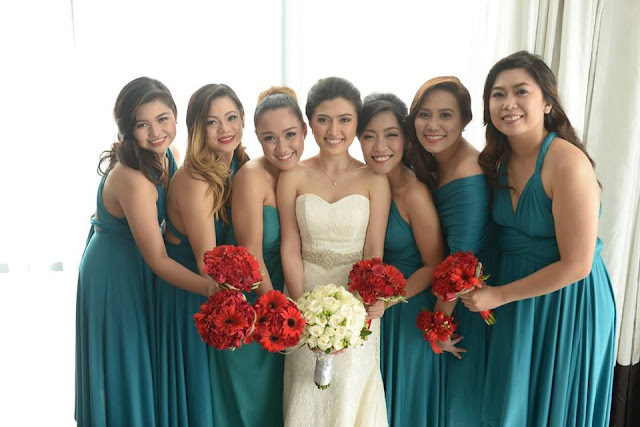 They are one of the very first suppliers we have booked, it was a year before our wedding. The horror came four months before our wedding when Monica called me out of the blue while I was out having lunch with my colleagues. She told me the unthinkable. Her sister was getting married in Boracay and she could not make it to my wedding to perform. I was at lost for words. I thought, okay here we go problems start coming in. I was so upset. Not only her, the male vocalist /guitarist, who happens to be her boyfriend, also could not make it, of course he's invited to the wedding. She said she would just recommend another band if that's alright with me. The band she recommended was their Team B (Team Ching). I didn't know they already have this Team A, B, C thing at that time. Team A is Monica's - the one I actually booked a year ago, which was being replaced all of a sudden by Team B. I really felt I was being shortchanged and cheated. At this point I was open to her suggested solutions, but at the same time I started looking for other options. I really felt bad. Though in fairness to Monica, she communicated with me frequently and properly, and tried to resolve the problem. To make the long story short, I ended up still getting them, Team B, but I've bargained to lower the price a bit (it was just to make me feel better since it felt like being downgraded), and had to make sure there would still be a male vocalist slash instrument player in one, as this is what the original arrangement includes, not just female vocalist. Also, the night before the wedding, Monica sent me a message that I have been upgraded to full band (I only availed of the lowest package). If she only told me this earlier, my disappointment would have been diminished significantly. Came wedding day, Ching's team was fantastic. We've heard so many great comments about their performance. Some thought it was recorded music being played during the bridal march. Ching was really good. I did not get the chance to talk to them during the wedding though. If it weren't for the disappointment and backing out issue, I would have given them a rating of 10. But I am still thankful because the performance was great and I got free full band upgrade! Ms. Berny is such a sweet and pleasant lady. She is also very polite and very professional when answering inquiries. I have a quite a list of HMUAs whom I have considered, you can see it here. I have chosen Berny because number one she replies to me and patiently answers my questions, her rates are reasonable, the client feedback's very good. The package I got did not include any trial or pre-nup HMUA, but I got her to add it for free.I did not do any trial HMU with her, the free pre-nup HMU served as my trial. 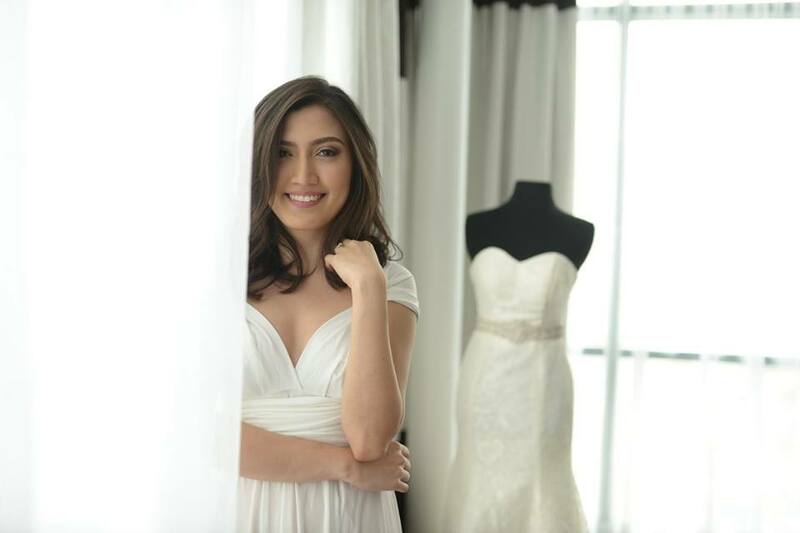 When we met her in Greenhills to book her, we briefly discussed the look that I want for the pre-nup, as well as for the wedding which seemed too far away at that time to talk about. You can read here how I ended up booking Berny Tia, and the things that I have considered. I am so happy that the hair style that I wanted for the wedding, which was a low bun with a bit of height on the top of the head, she was able to achieve. Achieeeve! My first hair style for the preps shoot at the hotel, which was soft curls, was also very nice. It looked so natural and effortless in photos. My make-up was beautiful. I specified that I want my eyes to be emphasized, I want plum, peach, bronze shades all over my face. Not too much pink. I also loved the hair and make up that she did to me for our pre-nup shoot, it looked so natural, which was so suitable because we did a casual road trip themed shoot outdoors. Our photographer also commended my make-up. See it here. I just had to take off a star because I have noticed in photos that my eyebrows were not that even, I am very conscious about that. My sister pointed out that she thinks it's obvious, though I think I still look dazzling haha! 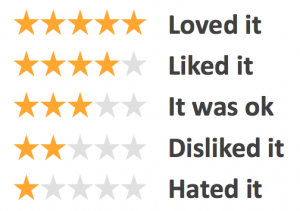 I just want to keep my ratings super honest. I still love Ms. Berny! 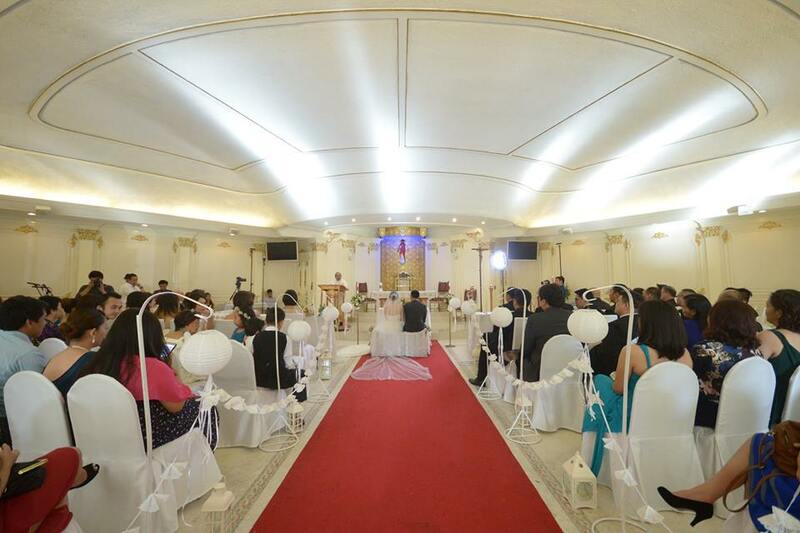 Astoria Plaza is a very popular choice for wedding preps venue because of its spacious and modern rooms, big windows and reasonable room rates. We also looked at Shaw Residenza since it is just across Archbishop's Plaza and has loft type rooms; as well as Lancaster Suies which is also near our church. Both seemed a bit gloomy, and might not look very good in photos and video. So I gave in to Astoria. This is the same hotel where my sister and cousins threw me a surprise bridal shower party. The suites we got for the wedding preps were only 1BR, but my husband's family had it upgraded to 2BR since their whole family slept at the hotel the night before the wedding. Luckily, since there were no more 1BR suites available at the time of our check-in, we were given a 2BR suite, the 2nd bedroom and bathroom were just locked. This gave us a much more spacious room for suppliers and family and friends to hang out - there were a lot! We saved a lot on the hotel rooms by only getting the 1BR suites since the main purpose is only for the preps shoot, rather than for overnight stay of our families. Astoria is more expensive than our first two options, but I am just so glad to have checked in here because the photos and video looked so much better than what it would have been in the other hotel options. You can see in some of the photos here how nice the suite looked in photos, especially the all white sheer curtains and floor-to-ceiling windows. The natural light gracing the room is just so lovely. We had no problems checking in and out. 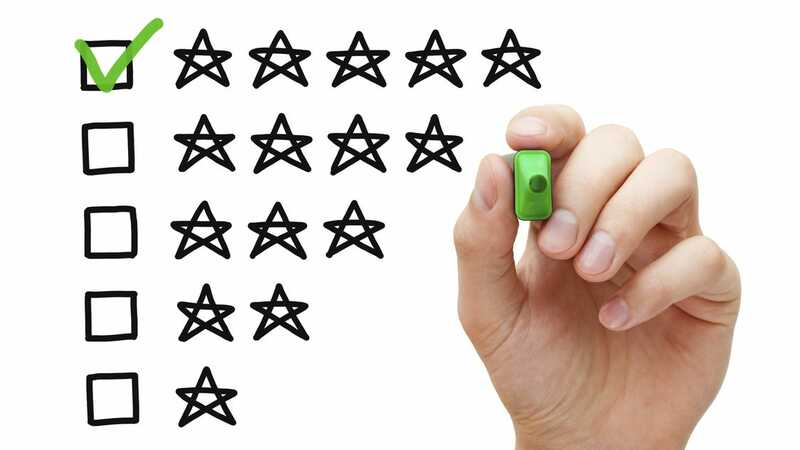 The suppliers were able to go in freely with no hassle. Astoria is used to wedding preps and suppliers. I know they do charge corkage fee for bulk food deliveries because my cousins and sister got charged when they ordered party trays for my bridal shower. So if you want to save on that, you can assign your coordinators or relatives to get your supplier meals from the supplier at the entrance or outside the hotel (or even the parking! ), and be the ones to bring it up to the room. If you want to do photo shoot in a public area of the hotel like the pool area, you have to submit a letter of request, which we didn't. I bought my dress ready-made. Found it, fit it, loved it, paid for it. But my gown hunting story did not come as easy as that. It was one painful process that I am not going to recount here because it might take up so much space, and your time. Probably will have to pour it out on one of my next entries. The Twin Entourage sometimes joins wedding expos. The staff that we were talking to, Kheil, was helpful. 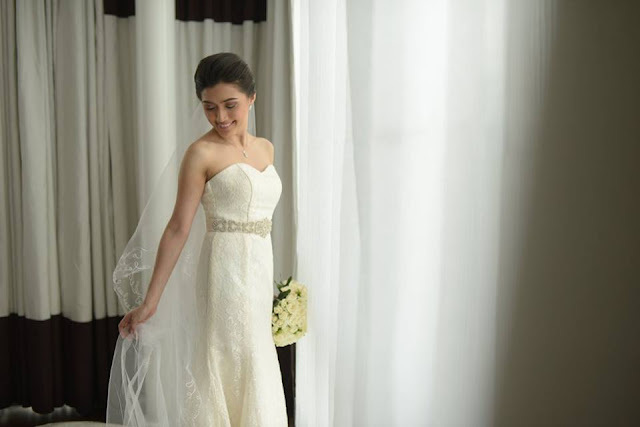 The wedding dress that I got was a simple and classy one. It's an all-lace serpentine cut strapless gown. I love how the fit-and-flair style of this dress flatters my body type, though a month before the wedding I had to exert efforts to lose inches off of my waist to fit in comfortably, which I did. I am not the ball-type, ruffles, stones, grandioso dress kind of girl. I'd rather have it plain, classy, timeless and sophisticated. I was completely happy with my wedding dress. I.L. Santos is one of the few tailors in 168 Mall that specializes in suits and barongs, they don't do gowns. They've had a few prominent clients to boot. My groom had his 5-piece suit tailor-made, we chose the fabrics. It was a dark gray suit. 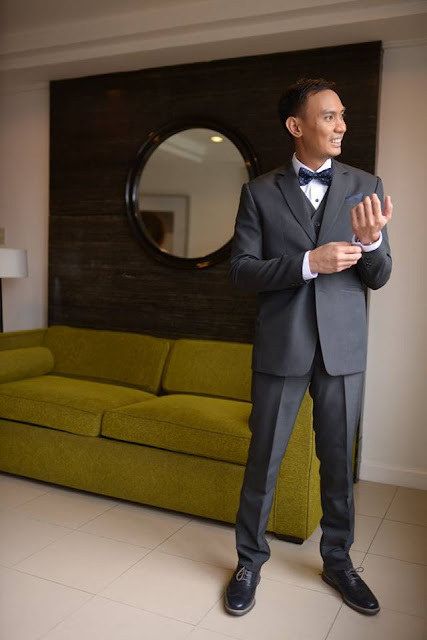 He was quite happy with it, my groom is not the 'pwede na' kind of guy especially when it comes to the clothes and shoes he wears. He is meticulous, and if it satisfied him, it must be pretty good. After we have book this supplier and my husband's measurements were taken, we went back thrice for the first fitting, adjustment, and pick up. We never had any problem with this supplier. I was also happy that I got to bargain a bit - because we booked on the spot. My idea for our bar was a DIY one. 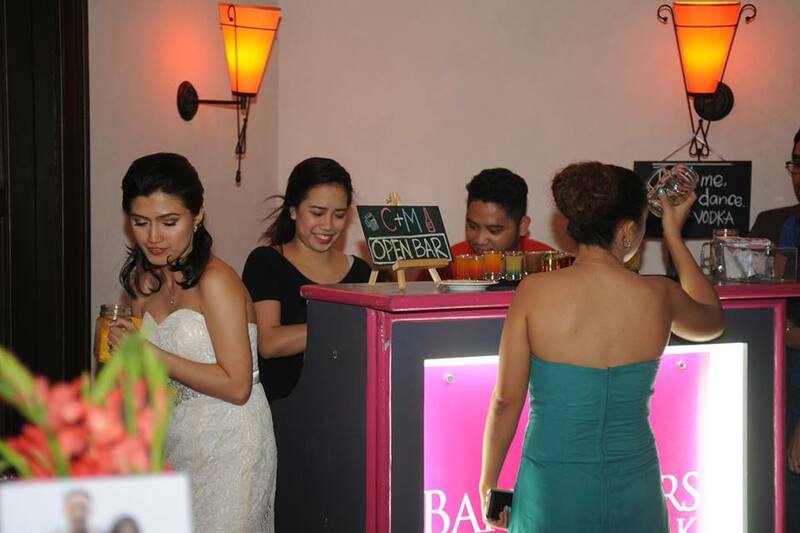 I saw this photo of a wedding reception in a blog, also in Light of Love, where the bar was not the typical mobile bar station serving cheap cocktails, but just a banquet table with a chalkboard sign saying BAR, it has a big metal bucket with all sorts of wines and expensive liquors. Drinks are served in paper cups. I thought it looked cool. The thing I hate the most about mobile bars was the cheap cocktails I can barely drink. I know my guests would not enjoy, these because I don't. We just wanted to buy the liquor to be served because we know what they drink. But going through the nitty gritty of doing a fully DIY bar, I realized it would be too tedious. With the utensils, ice, manpower and all. So I had the idea of just booking a mobile bar for the sake of having a full bar set up and bar tenders, but drinks will come from us. 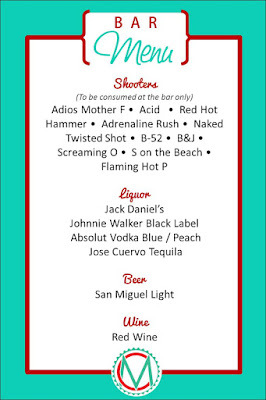 I kept looking for a deal in various deal sites and found one for Bar Tenders at Work that includes not just the set up and service I only wanted, but cocktail shooters also for 60 pax. Well, these are the cheap cocktails I warned you about, but it comes for free! I think of it as some sort of back-up or "filler" drinks. I had some special requests like serving the drinks that we brought, additional rock glasses, bar menus, etc. This supplier was so easy to talk to. I booked them directly instead of buying a voucher at the deal site, which is way better. I had to deposit payment in full. During the wedding party, I did not encounter any problems with them. They followed my instructions and requests. I think they did a good job. Their mobile bar, although pink, also looked new and good with nice lighting, compared to the shabby mobile bars of other suppliers. 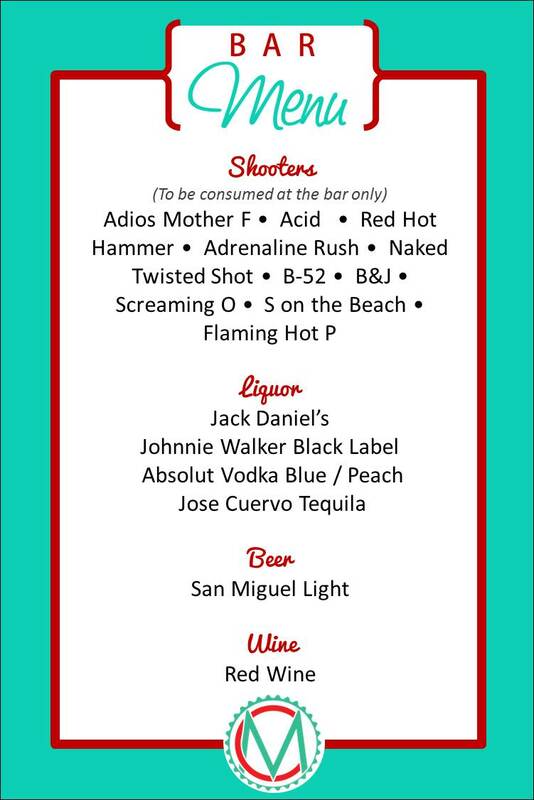 If you're wondering what kind of drinks we served, here's our bar menu which I created. All the shooters were included in their package, the rest we brought. A month before the wedding we went to her shop in Dangwa to finalize our flowers. I am thankful because she gave me so many freebies. I didn't even have to get a flower set up package for the church, aside from the lantern stands for the aisle and reveal curtain that I've rented, because I got her to throw in free flowers for the altar, candles and reader's podium. The cheapest package for church set up is Php 6,000 (including aisle flowers) which I did not have to spend! Ha! The package I've booked with her was only for the entourage's flowers. She also gave me free upgrades. Standard freebies are car bouquet, loose petals, throw bouquet and offertory flower basket. So came wedding day, the flowers for entourage were delivered very early in our hotel room. My mom received these since my coordinators have not yet arrived at that time. To be honest, I was a little disappointed as the flowers did not come so fresh. I can see a bit brown on the sides of the petals. The arrangements were good, the freshness of the flowers was what threw me off. 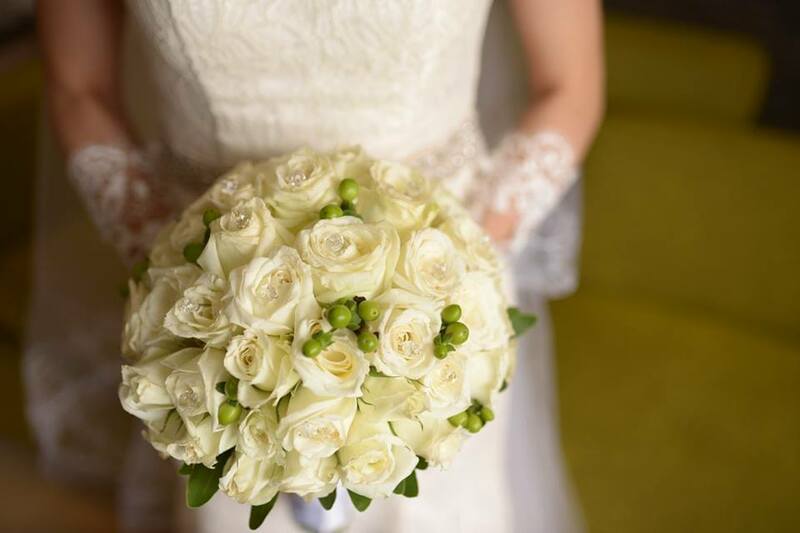 But I guess it just didn't bother me at all that time because there were many other things I have my mind on, and hello it's the my big day to just worry about the flowers. As for the church set up, I did not know of any problems encountered. The reveal curtain was actually beautiful, it's more than what I have expected. 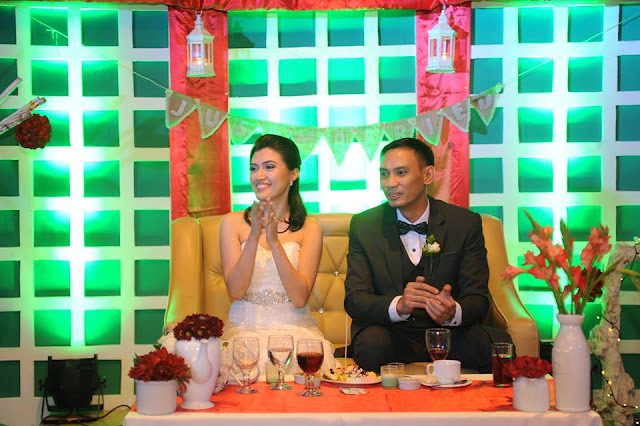 You can read here more about flowers, Dangwa Florist and the package I have booked. Supposedly I was not going to get a photo booth for our wedding. I just thought photo booths are too cliche. One is present in every single wedding I have been to (I think). But I couldn't think of other ways to keep my guests entertained / busy while waiting for us to arrive at the party venue, so ok might as well book one. I just had to make sure the background and props are not tacky, especially the layout of the photo print - so again I had to step in. Quirky Booth has standard backgrounds to choose from, and if you want a customized one they can create it for you with extra cost. I decided to make my own background out of crepe paper strips, and had my artist cousin help me out with the photo print layout. I want the layout to have big photos (of guests) , and no photo of us please. I want them to be able to keep these prints and even display these, and not just throw it away because it has a photo of us. 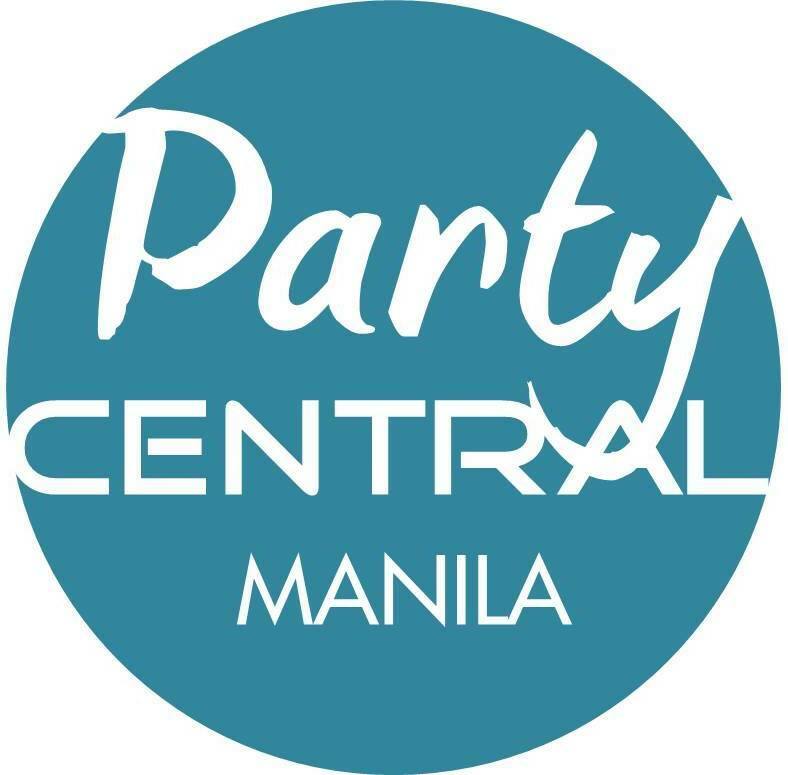 I found out about this supplier in Party Plans and Idea (PPI) group in Facebook. 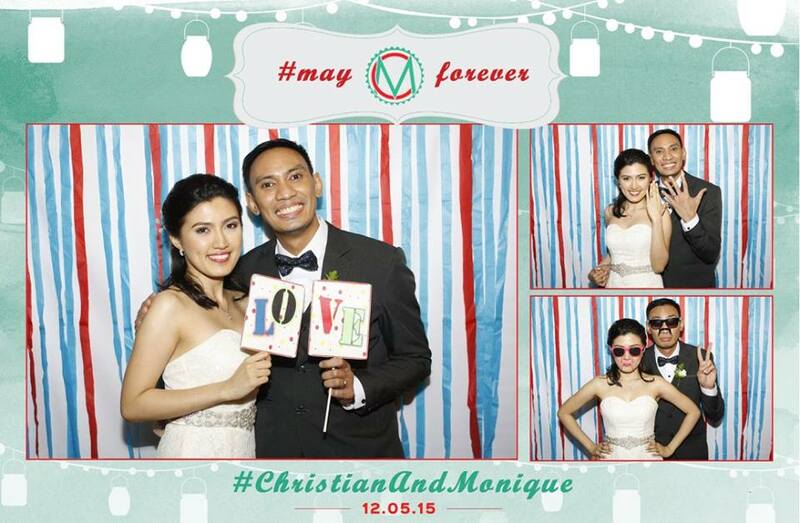 We got the 2-hour photo booth package which includes unli 4R prints. I felt that it's just the right length of photo booth time because it was only intended to keep our guests busy while they're waiting for us to arrive and start the program. It was opened as guests started to arrive at around 5:45 PM and lasted for 2 hours which was just enough until the program began rolling. Teng and Ingrid were pleasant and easy to communicate with. They were so accommodating and patient with my requests. I would be happy to get them again for a party in the future. I was satisfied with their service, and the prints. Plus I did not expect each print would come with a frame! This is one sulit supplier! We've booked Urbanista in one of our trips to wedding expos. It was unplanned because I was supposed to get our invites printed from one of our suppliers at work, and the design was supposed to be created by a good friend. But well, you know when you are at a wedding expo surrounded with a bunch of suppliers with "discounted" products, sometimes you forget about your own plans. So we've booked Urbanista for 50 pcs of accordion-type invitations. And since they also do the layouts, I've decided to give it a shot. I sent them my very detailed creative brief, specifying even the pantones of colors, but the first draft left me hopeless. So I turned to my good friend The James Abalos for our invitation design. James illustrated Anne Curtis' recently launched UNICEF children's book, it's his 7th children's book. He is a very good illustrator and designer, he's a member of INK (Ang Ilustrador ng Kabataan). As expected the layout turned out great, as I have wanted. I've sent James the same brief I've also sent to Urbanista. I am so thankful because he made time for it, I know how busy he was. Thank you James! Mwaahhhh :D You can reach him and check out his portfolio here. Urbanista printed our main invites, and CMYK Printhouse our secondary invites. CMYK was one of our regular supplier at work for event needs, and I know their quality of work. I got these complimentary. Yay! CMYKs' printing was better than Urbanista which we paid. The colors were better with CMYK. James, being the meticulous artist that he is, was not too happy with the colors of Urbanista's prints. They kept insisting we need to adjust the color in the file, but James and I both know that printers can adjust the colors with their outputs without the client having to send a new file. Colors really vary in monitors. So enough of the technicality, since it would take up so much time to do more samples, I just gave the go signal. It does not look that bad anyway. If it were not for CMYK's precise colors (they deserve such name), it would not bother me so much. But still kudos to Urbanista because, aside from the color concern, I did not have any problem dealing with them. They have also sent us a framed 3R photo similar to our invite cover as a gift. And thank you so much to CMYK Printhouse for the compli prints with great quality! 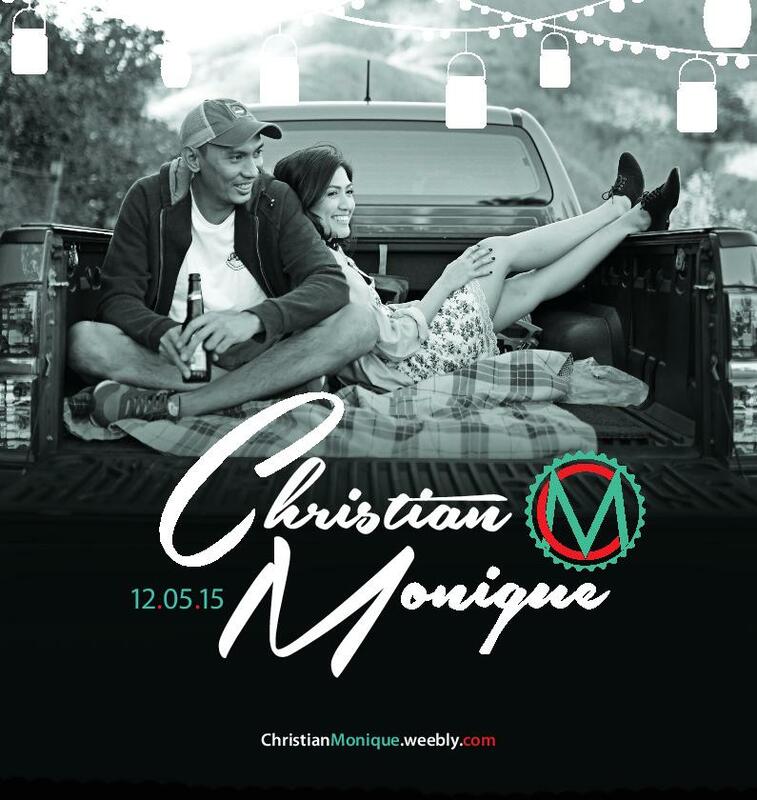 If you would like to get in touch with CMYK, you can contact Cocoy at cmyk_printhouse@yahoo.com or 09209261223. Alba's was also a supplier from work. They supply staff meals in some of the events I handle, and I know for sure that I can count on them. Their packed meals come complete with rice (generous serving), meat viand, vegetable viand, dessert, bottled drink, disposable utensils and a candy. It also comes at a very affordable price, and delivery is free of charge within Metro Manila. Our lunch meals, for suppliers and family / friends at the hotel, came with rice, 3 pcs BBQ sticks, sauteed pechay, C2 bottled iced tea, and buko pandan. While dinner supplier meals for some suppliers who needed to eat early or did not stay for the entire party delivered straight to the party venue include lechon and pakbet, and same inclusions as I've mentioned with lunch meals. They were delivered on time. Light of Love has only two accredited L&S suppliers, Sound Tech Pro and Strad Pro. I have read a handful of negative feedback on the latter, so I specifically requested Steph right from the beginning to assign Sound Tech Pro to us. It was a very good decision. The package with the venue includes basic sound system. I had to upgrade the sound system last minute for the band, thank God Kaice got to know that the basic sound system provided by the venue does not meet the requirement needed by our band, or else it could be a big problem. We also added mood lights which cost Php 4,000, but it was totally worth it, trust me! Lights are (almost) everything when it comes to the ambiance, especially during the after-party. I was hesitant as first with this additional cost, which I thought was unnecessary, but this is one of those pretty-to-look-at items on the list that would make so much impact. I also rented the projector and screen from them for the operation to be hassle-free, also less suppliers to deal with means less stress, less energy and time spent. Since we got mood lights, I was able to haggle with the projector fee. Smoke or bubble machine comes for free - I chose the smoke machine which was used during our first dance, and almost the entire time during our fun after-party. We have never encountered any technical problem light/sound-wise during the party. The short program went on smoothly, as well as the after-party. Alex was also very accommodating. We met him first during one ocular visit in LOL to check out the mood lights. I have always planned to get my female entourage (not including the principal sponsors) infinity dresses even before I have learned that this is becoming a common entourage outfit nowadays. Why would it not be? It is very practical, versatile, economical and pretty. I kept looking for ready-made infinity dresses in teal. our motif color, and luckily found them in a clothes shop in Binondo along Juan Luna St. I just felt such a luck box on that day. 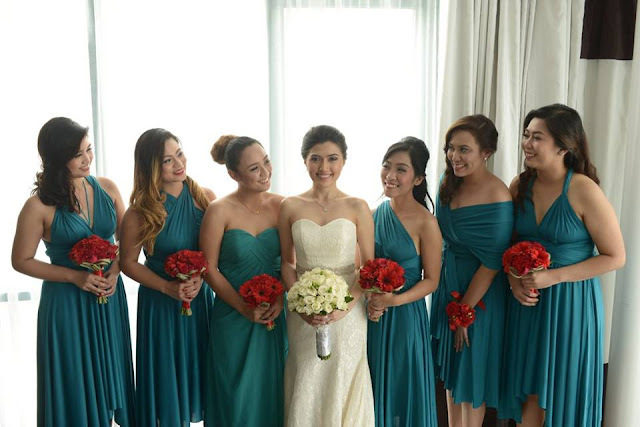 All are infinity dresses except for my sister's (strapless) who's on my right side, she's my maid of honor. Up next would be the highlights of our wedding day and some of my favorite parts! Hi, how much yung infinity dress?